Located in Santa Eulalia, near Santa Eulalia Beach, the Parque Aventura is an adventure park dedicated to outdoor recreational activities. These include rope courses and a paintball field with an area of 2500 square metres, including several natural and artificial objects in it. This rooftop acrobat park is a perfect place to have fun in communion with nature while imbibing a set of life skills including responsibility and confidence for kids and adults alike. The Parque Aventura opened its doors in 2010 and today offers a number of challenging courses, accessible to anyone above four years of age and exceeding one metre in height. 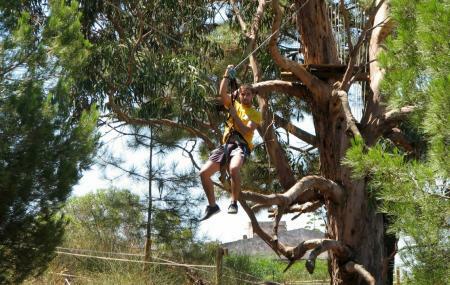 The adventure park consists of crossing trails from tree to tree by zip-lining, crossing rope bridges and using ascenders, through games and challenges of different levels of difficulty and skill. The laughter is sure to be riotous here. The safety in terms of the material used and supervision is commendable as every trail and activity is supervised by a team of young qualified monitors, at all times. There are no cafes here so carry some food. Reservations are recommended, especially for large groups. Bear in mind that there is no ATM machine available in the entertainment complex. How popular is Parque Aventura? People normally club together Olhos De Agua Beach and Montechoro Strip while planning their visit to Parque Aventura.